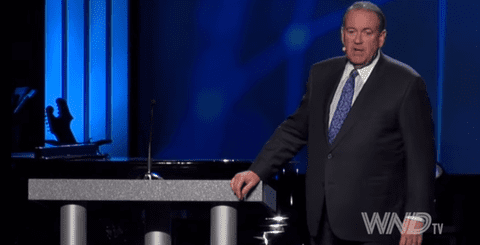 Speaking at the 2015 National Religious Broadcasters Convention in Nashville, Tennessee earlier this year, GOP Presidential hopeful Mike Huckabee said he wishes he could have pretended to be transgender in high school so he could have "showered with the girls" after PE, BuzzFeed reports. The comments came to light over the weekend when a video of Huckabee's speech was posted online by World Net Daily. In the speech Huckabee also sounds the dog whistle of religious liberty (yet again), and conflates providing civil rights to transgender persons with pedophilia and sexual impropriety. It would also be nice if Huckabee would sometime bring his brain when he shows up to speak and realize that his comments about supposed sexual misconduct say more about him than they do the LGBT community.